A ferocious veld fire swept through Eskom’s Koeberg Nuclear Plant nature reserve last week, destroying a quarter of the 3000 hectares of vegetation in the reserve on which the nuclear power plant is situated. The Nuclear Power station was heavily protected and guarded, thanks to the swift response of an army of firefighters from the City of Cape Town and Eskom on Tuesday, 16 February. At a press briefing on Friday, 20 February, Chief fire officer, Rhine Barnes who has been working at the plant since 1988, said the veld fire is the first threatening incident in the power plant’s history. Eskom staff working in the bulk stores— an administration building near the R27— had to be evacuated as the fire threatened the property. Luckily no person and or large mammals such as Zebra, Springbok and Eland were injured but unfortunately smaller land reptiles were caught in the fire, as well as rare plant species. The nuclear power plant itself was well protected, said Lewis Phidza, a stakeholder management manager at the plant. Power station manager Riedewaan Barkardien said the fire was on the perimeter of the reserve, about two to three kilometres from the nuclear plant and there was no major risk to the nuclear facility but they did not take any chances. Barkardien said there were 200 people on site battling to contain the blaze that started at about 14:47 on Tuesday, 16 February, originating from Kleinezoutrvier, a small holding to the east of Koeberg Nature Reserve, opposite the R27. “The fire entered Koeberg Nature Reserve as a result of heavy east to south east wind at a speed of 30-40km/h. Fortunately City fire and rescue services responded swiftly but unfortunately large swathes of the reserve were not saved,” said Barkardien. Phidza said the existing emergency plans as managed by the City were activated and City personnel were positioned at the plant’s strategic points in order to protect critical areas of the nuclear plant. Emergency plans worked as expected. “We dont think there is anything that emanated from the experience warranting changes (to the existing emergency plans),” said Phidza. Nuclear Services Manager Tobie van Schalkwyk said the plant operated as usual with units sending power to the grid. Van Schalkwyk said about three kilometres of the fence had been destroyed. 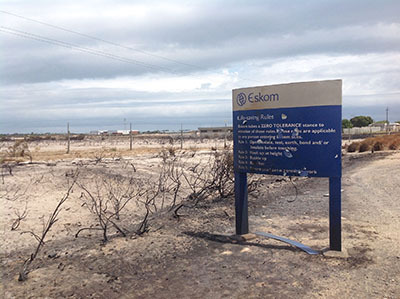 When the Eskom officials took journalists on a tour on Friday, 20 February to see the burnt areas, the blaze flared up again but was brought under control in time. The public is advised that the Koeberg Nature Reserve’s cycling and hiking trails are closed until further notice, however, the Koeberg Visitors Centre is still open.